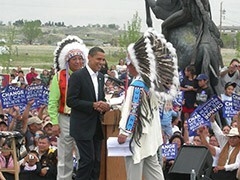 Then-Sen. Barack Obama greets tribal leaders at the Crow Agency, Montana, on the presidential campaign trail in 2008. 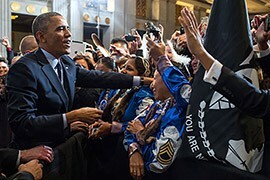 President Barack Obama was still a candidate for the office when he pledged to improve the nation-to-nation relationship between the federal government and tribal nations. Since then, tribal affairs have been relatively high profile at the White House, although many of the successes started years before he took office. Click on the image for a detailed, interactive timeline. It may not have been every day, but after six years the administration is getting generally high marks from tribal experts who say the president has given tribal relations a high profile. 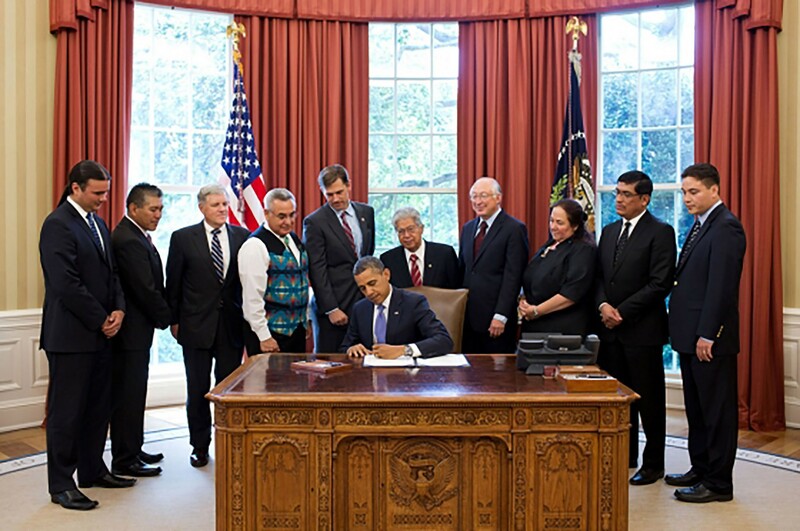 It comes at a time when landmark legislation for Native Americans has passed. Gains range from an overhaul of tribal courts to a multibillion-dollar settlement of a longstanding tribal suit against the government, but include lighter policy statements like the declaration of National Native American Heritage Month and presidential visits to reservations. “I certainly feel the commitment from the administration has been one of the strongest we’ve seen among a number of different administrations,” said Eric Stegman, a former Senate Indian Affairs Committee counsel. Not all the successes can be credited solely to the Obama administration – many had already been in the works for years before he took office, but his timing was right. Dossett appreciates what Obama has done since taking office, but said some of the policies of the past six years were being developed during President George W. Bush’s time in office. “Even though there weren’t a lot of accomplishments, they were interested in trying to work with tribes and talk with tribes,” Dossett said of the Bush administration. The Obama administration’s actions began with his campaign pledge to treat native nations as sovereigns: The year he took office, for example, Obama began what would become annual White House Tribal Nations Conferences. It was at the third conference in 2011 that he said the U.S. had reached a “turning point” in nation-to-nation relationships and tribal development. He later established the White House Council on Native American Affairs, a grouping of Cabinet secretaries and federal agency leaders tasked with furthering nation-to-nation relationships. In June, the Obamas visited the Standing Rock Reservation in North Dakota, becoming the first sitting president to visit Indian Country since Bill Clinton did so in 2000. Not all the advances have been ceremonial. Stegman points to the reauthorization of the Indian Health Care Improvement Act as the “single biggest thing” the administration has done, since it allowed for Medicaid expansion and improved access to healthcare for Native Americans. 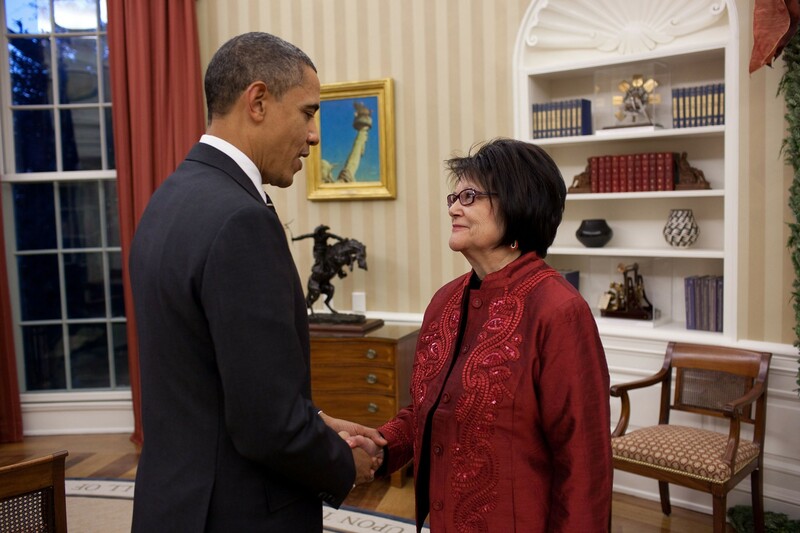 It was under Obama’s watch that the Violence Against Women Reauthorization Act of 2013 passed – with a provision to improve safety for Native women on tribal lands – and the HEARTH Act, which gives tribes greater leeway for surface leasing on their lands. Sherry Rupert of the American Indian Alaska Native Tourism Association said help has also come from administration proposals not meant specifically for tribes, citing an executive order aimed at attracting 100 million international visitors to the U.S. by 2021. European travelers in particular, she noted, “have an affinity for Native American culture.” But Rupert, the association board’s president, said the administration needs to provide Indian Country with funding and technical and trade assistance if tribes are to capitalize on the tourism push. The sense that there is more to be done, despite recent gains, echoed throughout discussions on the administration’s record. The Census Bureau said 28.4 percent of Alaska Natives and American Indians lived in poverty in 2010 and 29.2 percent lacked health insurance – close to double the national averages of 15.9 percent in poverty and 14.8 percent without health coverage. Dossett said the recent gains have addressed problems of the past and that now it’s time for the federal government to “fix the system” moving forward. “These are big steps forward for tribal communities,” Stegman said. Stegman, who now works at the Center for American Progress, said one way the administration could keep moving ahead is by funding efforts in Indian Country to help with comprehensive education reauthorization, language programs, housing and economic development. Dossett said energy development and subsurface leasing on tribal land would also encourage economic development and help tribes help themselves. Stegman said progress of the last six years has created a good partnership between tribes and the administration. He praised Obama’s efforts and said there is “something genuine that can be said” about his first visit to Indian Country. Dossett said the proof of that relationship can be seen in tribes’ new willingness to work with Washington. 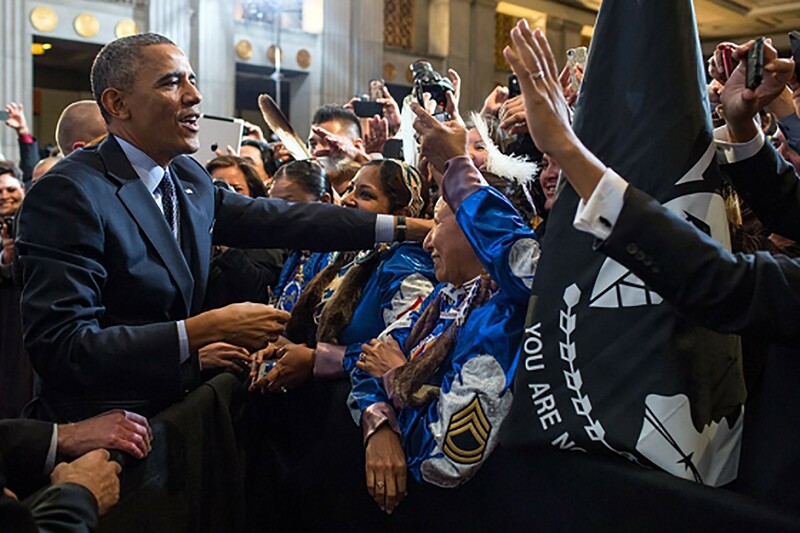 President Barack Obama greets audience members after remarks at the 2013 Tribal Nations Conference at the Interior Department on Nov. 13, 2013. It was the fifth annual conference bringing together federal officials and leaders from all 566 federally recognized tribes. President Barack Obama signs H.R. 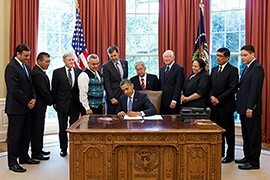 205, the HEARTH Act of 2012, loosening federal restrictions on leasing of tribal lands, while government and tribal officials look on in the Oval Office look on in June 2012. 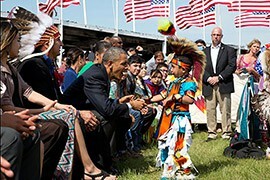 President Barack Obama greets a young boy during the Cannon Ball Flag Day Celebration at the Standing Rock Sioux Tribe Reservation in Cannon Ball, N.D., on June 13. 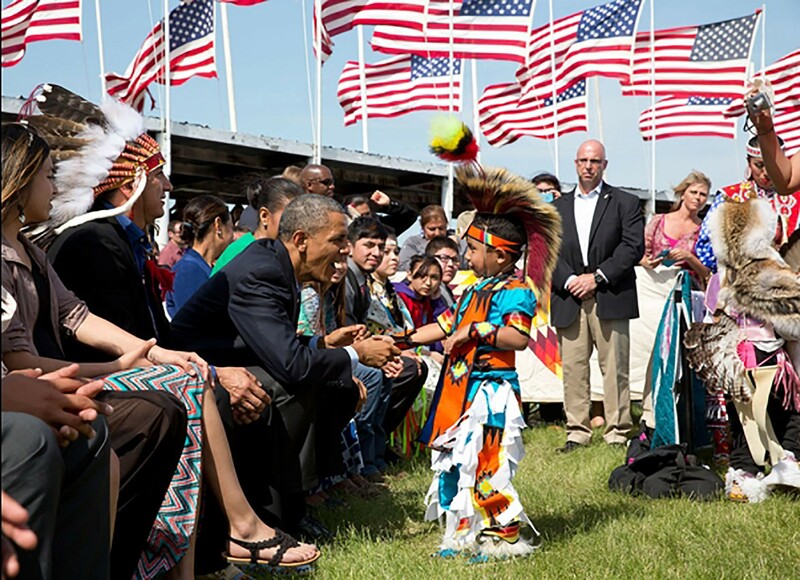 It was the first visit by a sitting president to Indian Country in 14 years. 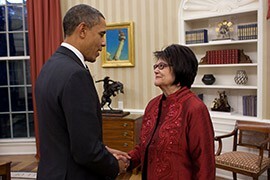 President Barack Obama in the Oval Office in 2010 with Elouise Cobell, the lead plaintiff in class-action lawsuit against the federal government for mismanagement of Indian trusts. It was settled in 2012 for $3.4 billion.